Lock in a great price for Sani Beach – rated 9.4 by recent guests! Great resort to relax and rest. Wonderful private beaches, pools, sunsets and more. The huge staff takes care of anything and everything, making your stay a remarkable experience. Location is good, just about 45 minutes drive off the Thessaloniki airport. One of the best staff members was Aggeliki Sarakinou! We bacame real friends and she helped us a lot with everything to make our staying comfortable and pleasant and helped to solve all minor things we had. Sani Beach is an excellent place to stay! This is truly an exceptional hotel. 1. The resort is beautiful and very well maintained. Clearly the resort spares no expense in keeping the hotel looking new and fresh. 2. Lots of restaurants to choose from, excellent service and good food. 3. The most impressive aspect to me were the employees. They bent backwards to make us comfortable, graciously, with a smile. Clearly, they are happy to work there. the location, nice and professional staff, very clean,nice decoration and set up professional. We spent a wonderful week at Sani Beach. The staff were incredible always going out of their way to help. All the food was excellent. We enjoyed fitness (Run, TRX, Yoga, Paddleboard Yoga) and water activities (SUP). Kids loved the Melissa Mini-Club and the staff were wonderful and very flexible. Evening events were well done. Would recommend it highly! Great food! Perfect location! Exceptionally friendly staff! Full wifi internet coverage of the whole resort including parks, the marina, etc! Wow! What a wonderful location. Of all the hotels I've been to, this by far exceeds my expectation. The staff are beyond amazing most especially at Sani Beach hotel. I've already started recommending it to family & friends. Sani Beach This rating is a reflection of how the property compares to the industry standard when it comes to price, facilities and services available. It's based on a self-evaluation by the property. Use this rating to help choose your stay! Overlooking the azure waters of Cape Sani, the Sani Beach offers a lagoon-style swimming pool, a spa center and restaurants with international flavors and Greek cuisine. 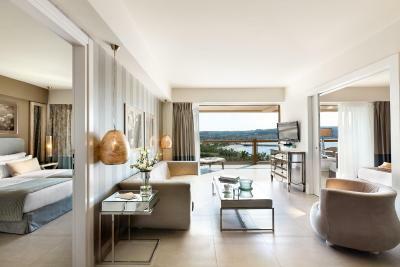 Each of the light and airy rooms offers views across the Aegean or the beautifully landscaped gardens. They all come with a private terrace or balcony and bathroom with rain shower. In-room amenities include a flat-screen TV, mini-bar and air conditioning. 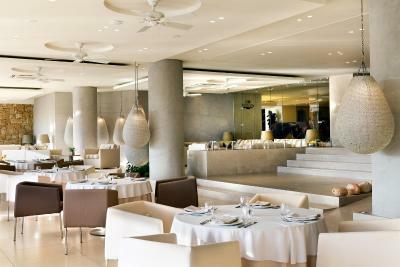 Poseidon Restaurant proposes a culinary experience for all the family with themed buffets each evening. The Veranda Restaurant offers an open-kitchen experience which serves a selection of Greek and Mediterranean dishes with views over the Aegean Sea. Guests have easy access to Bousoulas beach with its 4.3 miles of pine-fringed sands with clear water, ideal for snorkeling. The beach has been awarded an EU Blue Flag and the shallow water is ideal for children. Several fun activities for younger guests are also organized, along with dancing, football and sailing lessons. The Sani Beach occupies a prime position on the Cape. Guests can seize the opportunity to enjoy water sports, play tennis or take off into the Mediterranean scenery on a mountain bike. This property is also rated for the best value in Sani Beach! Guests are getting more for their money when compared to other properties in this city. 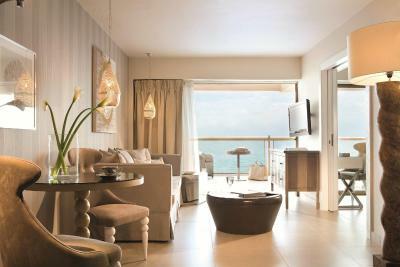 When would you like to stay at Sani Beach? Spacious room with furnished balcony offering view of the grounds. Please note that this room type cannot accommodate an extra bed or crib. 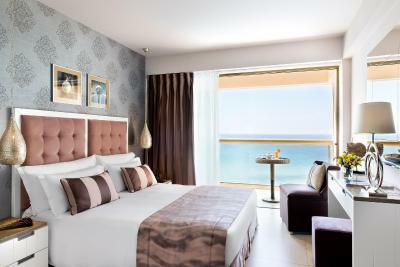 Spacious room with furnished balcony offering view of the sea. Modern suite with sea views. It has a bathtub with tropical rain shower or a walk-in tropical rain shower. The room rate is based on 2 guests. Maximum occupancy is 3 adults, or 2 adults and 1 child or 2 adults and 2 children. In the last case, no extra bed can be accommodated (see Hotel Policies). Children up to 12 years old stay free of charge. Interconnecting doors conveniently combine two double rooms into a spacious family room. Maximum occupancy is 4 adults, 3 adults and 1 child, or 2 adults and 2 children. 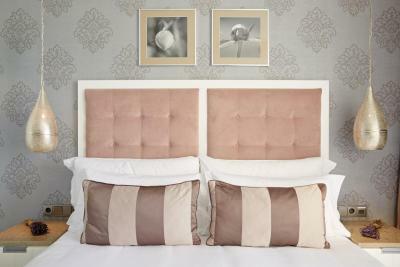 This luxurious family suite comes with 2 beautiful spacious bedrooms, a separate living area and 2 bathrooms. The master bathroom comes with bathtub and separate tropical shower, while the 2nd bathroom offers a tropical shower cabin. Both have luxury bathroom toiletries by Anne Semonin. 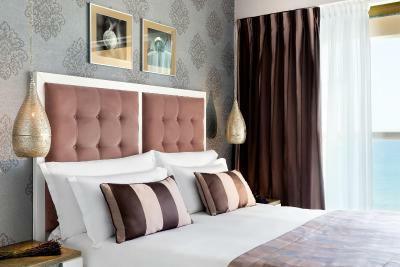 The contemporary design features floor-to-ceiling windows, Dream Beds and balcony with rattan coffee table and chairs. The suite can accommodate up to 4 people - a maximum of 4 adults and 1 child or 2 adults and 2 children up to the age of 12. Lavish and vibrant Resplendent above the azure waters of the breathtaking Cape Sani, the luxuriously renovated Sani Beach exists in harmony with the natural world around it. This spacious hotel promises a five star experience for all the family with its exclusive beaches and miles of golden sands, enticing spa and impressive restaurants with their choice of international and Greek cuisine. House Rules Sani Beach takes special requests – add in the next step! Sani Beach accepts these cards and reserves the right to temporarily hold an amount prior to arrival. the price of the meals at the restaurants, if you dont take the set menue, is a ripp off. Also Prices for drinks coffee etc are very high in fact exhorbitant not only for Greece but even higher than saint tropez, and other similar places. If you are going to stay a week and need transport from the airport, it is better to book through the hotel website directly than on Booking.com. Ended up costing us 180 Euros round trip for our family of 4 but would have been complimentary if we had booked through hotel website. The half board deal is less than a half - you may either have dinner at one of the 2 hotel restaurants (lower quality food) or try out some of the dozens of resort places (much better food) by getting a 20 euros per person "allowance", or choosing a "set menu". Water are extra charged, not to mention wine. This way you find yourself spending much more than you planned on dining. It's important for me let other visitors know, because none of this was noted at the time of reservation. Nothing really, everything is always perfect! They could do with a bit more activities....not much to do. Would have liked to see more hooks in bathrooms to hang towels to be reused.